Wow the enemy is literally blinding tooooo many believers, it is unreal. God help us, do not be deceived by these new age philosophies, and do not get entangled with people that twist the Word of God. Fusing the wisdom of this world with the Word of God, no no no no it does not work like that. I am seeing the most twisted and messed up theories these days that people are trying to initiate into Christianity. Some of them are even somewhat comical, and they try to persuade me with it as well, as if I do not know the Word of God. Get that mess out of the body of Christ, we do not want it and neither will we ever accept it. Once you give me opinions I will not listen, I do not want nor do I need your opinion what I need is the Word of God that is all. People are just being led astray anyhow, open your eyes please! The end is very much near. There are more lost, than there are saved. Believers in the Lord Jesus Christ, if only you knew the foolishness that the enemy is trying to deceive many with, you would pray and intercede more. 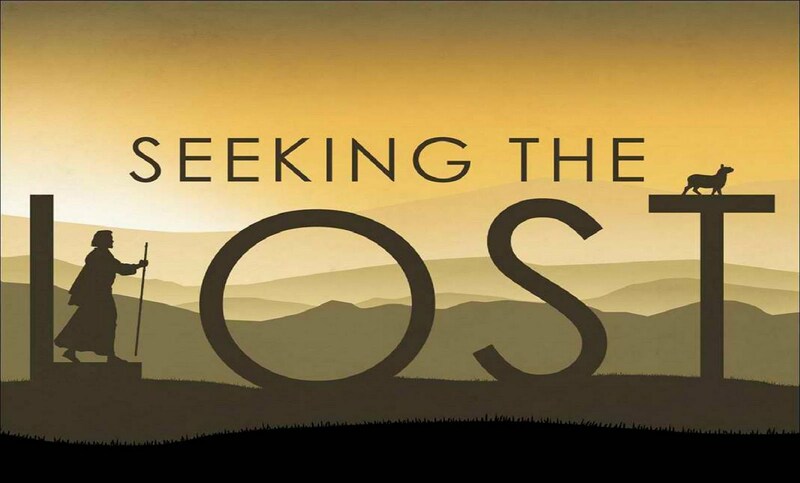 Pray that The Lost shall be found, and in these last days believe me it is very much possible for believers to be completely, utterly, and totally lost. Do not accept the lie that the enemy is bringing into the church. God is the same yesterday, today, and forevermore. Your theories, philosophies, theologies, and opinions are NOT needed in the body of Christ. Believers, DO NOT BE DECEIVED. Gosh, believers are believing the word of man more than they do the word of God. How can you put your trust and belief in a human being? A human being just like you?! A human being just like you,that God Himself created?! Oh come on, open your eyes. Lord open our eyes, and let us see You. It’s just sickening, honestly the way people have chosen to live their own Christianity, the kind of Christianity that best suits their own lifestyle. Tell me, who exactly are you serving? God is love, so how can you now tell me that you’re a Christian but you only have love for yourself and nobody else? 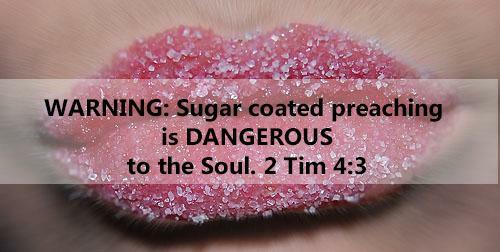 Sugar coated messages that’s what we love, nobody wants to hear the truth, because the truth offends, and nobody wants to be offended, so they would rather believe the lie. So who are you believing then? Definitely not God, because satan is the father of lies. I hate sugar coated messages. Hate me for speaking the truth, I do not care my reward is in heaven. I’d rather you hate me for speaking the truth, than love me for telling you lies that will only lead us to hell. God is love, so how can you now tell me that you do not believe in forgiveness? God should forgive you, but you have the right to not forgive others? Who told you please, who gave you that right? I don’t know if we think God is playing games or something, the problem is the lack of fear for God. If we mock God, we also will be mocked. Which Christianity are you talking about? if you do not believe in loving others and forgiving others then you are not a believer it’s as simple as that. Give your life to Christ once and for all. Stop all this I’ll do it when I’m older. No the time is now. Only God knows your beginning, and your end. Don’t you realise how fast time is flying by, and doesn’t that scare you? You better stop playing games with God, before it is too late. Just because so and so is doing something doesn’t mean you can to. 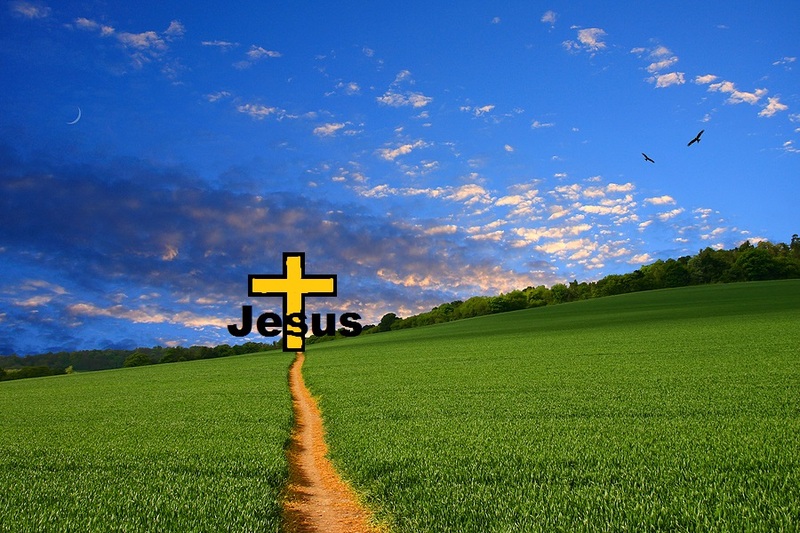 I’m speaking to Christians, you spend more time listening to what that famous philosopher said, than you do listening to what your Lord and personal Saviour Jesus said, and now you’re confused, and now you want to fuse the two, and now you have come up with your own Christianity. You want to live your life for yourself, and not for God, for you God is only for Sunday, and whenever else you need help. You only remember God when it best suits you, you don’t even realise that God speaks, you don’t even know that God wants a relationship with you. A Christian cannot live a selfish life, but a selfless one. Many Christians need to reevaluate their lives. Christianity is not the Sunday church routine, it is more than that it is having a relationship with Jesus Christ. If you really are aware of all that is going on around you, you will really take the time to reconsider your ways. Believers, we need to pray, I don’t know if we understand how much of a joke Christianity is becoming, it’s so sad honestly. The lack of power, miracles, authority, signs, wonders, and healing. All because we have turned Christianity into a joke. I am being honest it is not being taken seriously at all and this has just got to stop. The world now embraces Christianity because it is changing, it is evolving. And the church accepts that as if it’s supposed to be a good thing. The church is succeeding in seeking recognition from the world for fame, when we ought to seek the world to be saved and not for selfish gain. Someone told me that they accept Christianity now, because it is changing. Christianity has not changed, God did not change His Word, man did. The world can try to change the Word of God, but His Word still forever remains the same. Believers, please stop being so easily deceived by the foolishness of this world, and by the many wolves in sheep clothing. 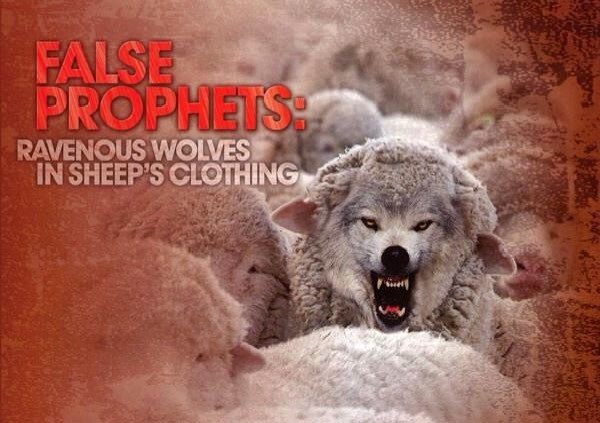 There are many wolves in sheep clothing. The Lord said you will know them by their fruit. Their fruit should be the Word of God. A form of Godliness, but denying its power thereof. That’s the wolves in sheep’s clothing. Toooooo much deception in the body of Christ. Lord please open our eyes. I don’t believe any one of us wants to experience God saying I never knew you. Imagine you never missed a day of church, and He says to you; “I never knew you, depart from Me”…wow. The world will make it like its a joke, of course they will they don’t know God. God is wisdom, and the wisdom of this world is foolishness. Do not allow yourself to become a fool. Believers refuse to see as much as a non believer does. What is a Christian without the power of God? As much as we like to deny it, or make excuses for it we need the raw power of God. His power makes the difference. Those in dark high places they know, they know how blind the world is and how easily they can be deceived. That is why the evidence, and all the signs can be there and yet the world will still refuse to see. The world can be so easily deceived, God help us. they will tell you that you are too deep, they will try to make you look stupid but God says the foolish ones are those who say there is no God. God please open up our eyes, and help us not to be so easily deceived. And I’m forever grateful, Lord, to You. Shining in Your Light and Your Glory. 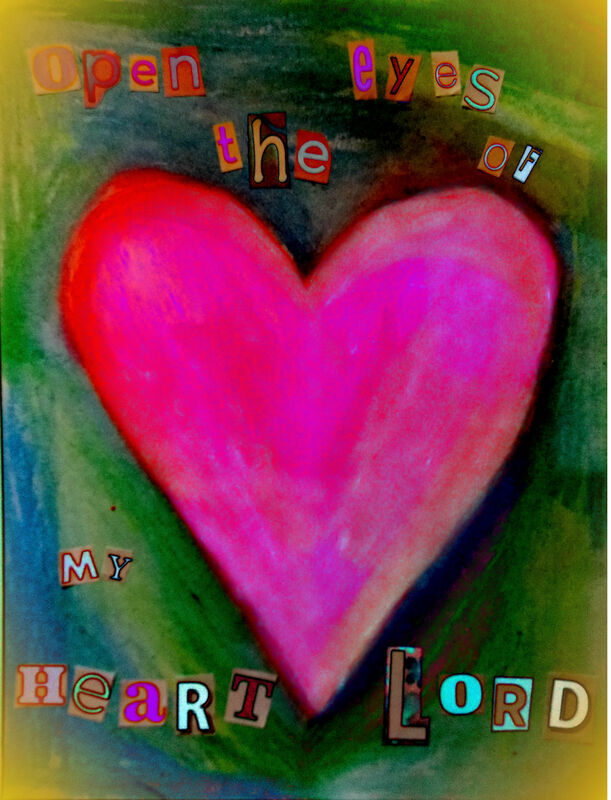 Pour out Your Power and Love! Now don’t take this the wrong way…I can appreciate where you are coming from and your faith is obviously serious business, which is admirable. But, does it have to be. All strict and God fearing? I don’t think that anyone should make Christianity a joke, but everyone is not going to be completely rigid in their beliefs…does a lighthearted attitude mean a weaker faith? I’m not really sure if I have understood you well but in Christianity yes it all has to be God fearing we ought to fear God as believers. I have faith, but it doesn’t make me perfect and it doesn’t mean I get it right all the time. In that moment of sin, I am not considering my fear for God unless I repent that’s when I acknowledge that I fear God. God is a God of His Word, if live a life without repentance, then I am likely to be condemned to eternal damnation and that is strict but I have the freewill to choose. What’s really strict is to be condemned to eternal damnation there’s no freedom there if I do not repent, and to be accused by the accuser satan. There is a law, God’s law and we ought to obey it as believers but God knew that we just couldn’t get it right all the time and so that’s why He sent His son JESUS, and through JESUS Christ we have been redeemed by His Blood. Jesus is ever interceding for us, He is praying for us, great is His His love, grace, and mercy towards us which is no excuse to sin but there is freedom, freedom not to make excuses to sin, and stay in sin, but freedom to repent and be forgiven, restored, saved, and renewed. Also there are different levels of faith. When I became born again I didn’t really know The Word of God for myself, I attended church every Sunday but I did not have an intimate relationship with Christ until I decided to take time to study the Word myself like it says in scripture study to show yourself approved. It was not until I made that decision that my faith developed, and I am going higher and higher I’m not there yet but the more I go deeper into His Word I believe and trust He elevates me it doesn’t make me better, I am still learning and growing. However, as believers we are responsible for working out our own salvation as it says in scripture there must be a time in every believer’s life where they strengthen their spiritual lives in the Lord. This is the example given to us from our Lord, and personal Saviour Jesus and we also see it in the lives of the apostles and disciples. Ordinary people from different walks of life, and once they surrendered their lives to Christ they became born again and a change took place in them and that was witnessed. 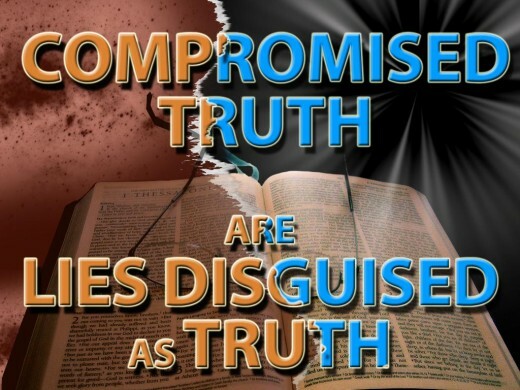 In this message I am addressing things such as sugar coated messages, wolves in sheep’s clothing, compromising God’s Word, confusing God’s Word with philosophies, and theologies, twisting it with opinions instead of getting revelations from God, and so on and so forth. I’m not sure if it is coming across as too serious or harsh but unfortunately it is the harsh reality of what is going on in the body of Christ, and also from personal experiences where I have been told things by Christians which are totally against The Word of God, and also from what I have discerned in different areas of the body of Christ. It doesn’t mean I am disregarding my imperfections, or judging, or anything like that I’m just simply sharing what The Lord has laid on my heart and its sharp but that’s His Word for you I’m just obeying that is why I said God help us, we need to pray near the end of the message. And though He is serious hence why we fear Him as believers, He is also fun, funny, and just enjoys normal, real, genuine, honest, transparent fellowship with us. I have and still am experiencing this with Him as I have my personal time with Him, and we also notice this between Moses and God. What a relationship, what a friendship. I hope this has answered your question, and I pray I’ve understood your question. My Grandma has her personal time with him every night and she talks away to him. Last week she told me that he now talks back. IDK, all my conversations have been 1-way.